Well, that special day is drawing near. And as it does my thoughts turn to Christmas as a kid: toys, snow, the tree and, of course, Santa Claus. Growing up as a kid, Christmas was probably the most special day of the whole year. I'd looked forward to it for months. I'd pretty much have the Sears Christmas catalogue memorized by the time I had to pull my wish list together. 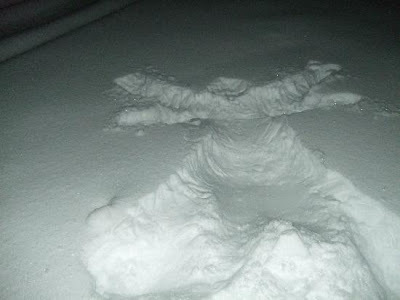 And if we were lucky, it had snowed in the days leading up to Christmas and we'd make snow angels and snow men. A snowball fight or two with the other kids on the street was a certainty. I grew up in Toronto. In the suburb of Scarborough to be precise. There weren't any big hills near our house - and we didn't have a car - so I had to rely on my friends' parents to drive us and our toboggans to the nearest snowy slope. There was an outdoor skating rink nearby, though, and we would spend hours at Clairlea Park playing shinny. I walked to and from Our Lady of Fatima School everyday. All my buddies were protestants, so it was a quick solitary jaunt of about 5 minutes. I recall I used to wet back my hair each morning just so it would freeze on the way to school. This was a favourite activity of mine, daring the elements to break chunks of my frozen locks off. They never did. But it was interesting sitting in my desk at school for the first half hour as the ice melted and ran down my forehead and the inside of my shirt collar. In Grade's 3 and 4 I attended St. Michael's Choir School in downtown Toronto. As Christmas approached the students would practice for the big Christmas concert - an annual affair at the Knights of Columbus Hall. St. Mike's was much further away than Our Lady of Fatima and required me taking a bus and the subway to get there. But I didn't mind. Especially at Christmas. You see around the corner from the school were Eaton's and Simpsons, two huge department stores. And as Christmas approached both stores decorated their street-level display windows with all kinds of Christmas scenes using shiny decorations and thousands of lights. It was like they were in a contest to outdo each other. One year, the magic of Christmas lost it's sheen. A couple of the older boys from across the street told me there wasn't a Santa Claus. They told me they had proof. One of them had found some presents in his parents dresser drawers and said he had placed special marks on them. Guess what? On Christmas, he received the same presents, with the marks, from Santa Claus. In later years this delinquent would spend time in a penal institution. OK, I made that up, but he should have. I was crestfallen. And my mom - I don't know why to this day - confirmed the horrid fact and killed the dream that eventually dies within each child. But one day I had kids of my own, and now I have grandchildren and - guess what? There is a Santa Claus! 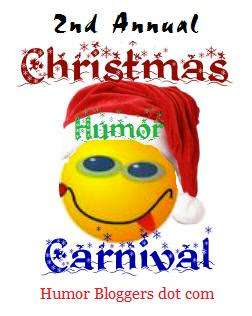 Check out Humor Bloggers Dot Com today and the rest of the week to see what other Christmas tales are being told. Hey, and be sure and come back here tomorrow! You mean I bought my kids all these presents for NOTHING?! Moooooog: Sometimes he needs some help. Hindleyite: My grandkids can't read yet but one in particular gets the Santa concept! Oh my gawsh, are you THE kid from the movie: A Christmas Story? Every pic you painted reminded me of the movie. Did you get a bunny outfit? I can see Nomie hop, hop, hoppin' along! Quirks: That's my favourite Christmas movie of all time. I guess it just appeals to the kid in all of us. Same here. The grand kids actually make it fun to spend all of my money. Don: That's really what it's all about. They just love it. And that makes it so much fun for the rest of us. Have a Merry Christmas Don. Wish I could recapture the Christmas excitement I felt as a kid. This helped a lot. Thanks and Merry Christmas. Jayne: It's funny. When you stop to think about these things, the memories come flooding back. Glad you enjoyed it. I think I must have been a born skeptic or something. I don't remember being devastated by the news about no Santa. It just made so much more sense that he didn't exist! But I never told my Mom I didn't believe and she probably thought I did until I was 21. I always say that Santa is real for anyone who believes in him. Oh, yeah... and I gave Vlad bullets the past two Christmases in his stocking and he didn't even shoot his eye out. Amazing! Guess he's old enough now for that Red Ryder BB gun. I am glad you believe in Santa again! NGIP: Sounds like a good strategy! So you sat in a stranger man's lap every Christmas? Cat Lady: hahaha Sounds like Vlad's a better aim than the kid in the movie. Christiejolu: Santa Claus is coming to town! Hope you have a great Christmas, too. Nice post, NoName. Life was sweet when we were young, or younger. It can still be sweet now, too, thanks to kids and grandkids and neices and nephews. Mike: Yep, you've got that right. And it's those little ones who help bring back those memories.